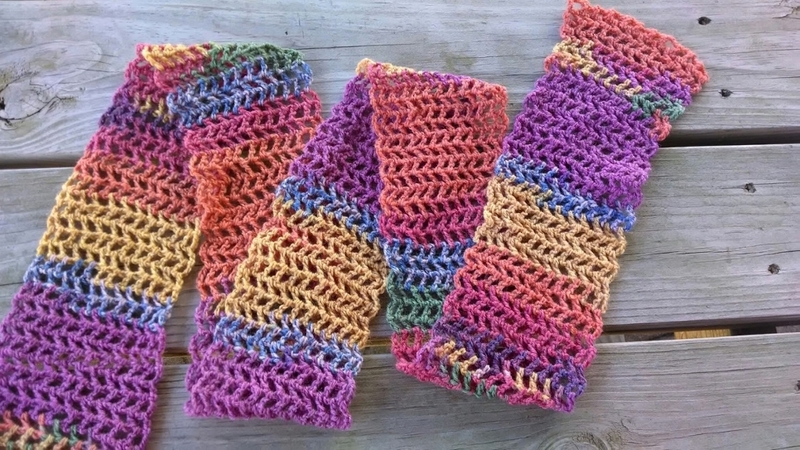 The Mango Salsa Scarf is a joyful and pretty scarf crocheted with fun sock yarn. 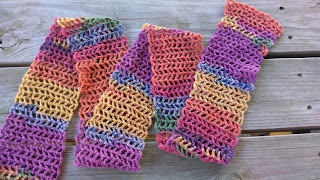 Use self striping yarn as shown or have fun experimenting with variegated, hand painted or solid varieties. A super simple mesh stitch sequence adds lightness while still being soft and cozy. Sock Yarn of your Choice, scarf shown used 393 yards. Yarn pictured is Sensations "Truly Pattern" in the "Bright Multi" colorway. However, feel free to use your favorite sock yarn. This pattern produces a stretchy, drapey scarf, so a variety of different sock yarns would be lovely. Foundation row: DC in 7th chain from hook, *chain 2, skip two chains and work one DC in the next chain, repeat to end. Row 1: Chain 5 and turn. *Work a dc in first chain space, chain two, repeat from * to end of row. Repeat row 1 until scarf reaches desired length. Fasten off. Weave in any ends and block if you like (scarf shown is unblocked). Awesome, I'm so glad you like it! Thanks! I love that sock yarn too! Thankyou.. Will try this as soon as I can. The problem is that you provide may be worth our time and also effort. Could you give a length of the scarf pictured? I like the length just as you did it. Thanks. btw, I was looking for something to use sock yarn on other than socks. I love the colors they make this yarn in. this would make such a great little cowl!